Announcing the release of Dig Dug 35th Anniversary Edition to the AtariAge community! 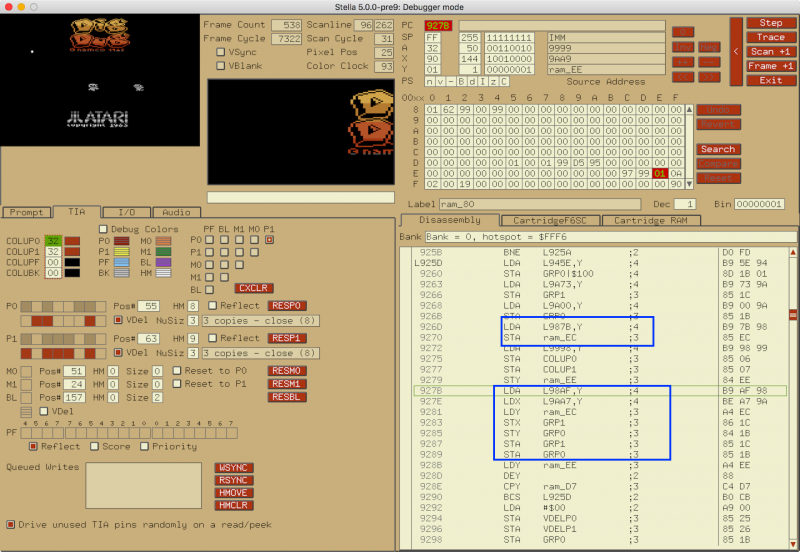 This hack started as a graphics update to a fine hack known as Dig Dug Arcade. 1) All of Dig Dug's animation frames. 2) All of the animation frames for the falling rock. 3) All of the fruit/vegetable bonus items. 1) Static (unloosened) rocks using the first frame of the falling rock animation instead of the ball sprite. 2) Terrain (strata) divisions made wavy instead of straight. 3) Terrain having a dotted pattern instead of lined. 4) Tops of some of the fruit/vegetable bonuses (carrot, turnip, tomato, pineapple) made a different color than the main body. 5) The mushroom and garlic bonus items changed to colors that better match the arcade. 6) The "8" in the "© Namco 1982" on the title screen made to look more like an 8 (I'd fix this one myself but I can't seem to find it when viewing the rom graphics in Hack-O-Matic). Please enjoy and Happy Birthday to both America and Dig Dug! Nice job improving the sprites (no more green duck) and the title graphics look great too. I'm wondering though (at least in emulation) why I'm seeing various graphic glitches above and below various sprites at times? I don't recall seeing them in the original. Thanks MrFish, but I can't take credit for all of that as my hack was built off an earlier hack that already updated the sprites for the monsters and added the title graphics that you like. As for the graphics glitches, are you playing the game on the Flashback Portable or on a PC Emulator? I was seeing them when I played the hack on the Flashback Portable and managed to eliminate most of the ones that I saw by changing the location of the sprite graphics in the rom (moving them up or down). The only one that kept cropping up from time to time was that the upper tip of the garlic would be duplicated below the actual sprite on the first level that it is used as the bonus item, but I thought that was just a weird Flashback thing because that glitch would seldom show on the second stage. I wonder if anyone has tried the hack on actual hardware? If so, please let me know what issues you find and I will attempt to fix them if I can. Correct, I guess I should have read what was posted. I just busted into the game and posted a response comparing to the original version. I was in a hurry when I posted though. Edited by MrFish, Fri Jul 7, 2017 10:43 AM. OK, I just dug (pun here) up the hack you're working off of (Dig Dug Arcade) and I'm not seeing any graphical glitches with it using Stella v4.7.2. Nice graphic hack, NostAlgae37. Can you please release a PAL60 version of it for the european users? Would be great! Unfortunately, I don't know how to do that, but someone else is welcome to. (I'm just an artistic type, not very technically-minded.) By the way, have you tried the hack on actual/original hardware? If so, can you please confirm whether you are seeing any graphical glitches of any sort? Thanks very much. By the way, have you tried the hack on actual/original hardware? If so, can you please confirm whether you are seeing any graphical glitches of any sort? Thanks very much. Have not tried the game with the Harmony in my real PAL-Atari-console until now, because with the wrong colors, games make not so much fun. But i can confirm, what some other people here mentioned, that in some of the STELLA versions there are some graphical glitches besides the sprites. 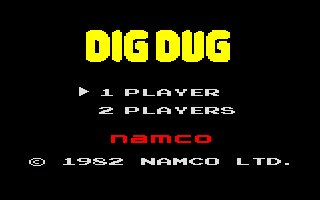 There is another, older "Dig Dug" Hack here in the forum, called "Dig Dug Arcade" or so (can not find the thread in the moment) and this hack has no graphic-glitches in all STELLA versions. Only this hack here has. There are some pixels in the near of the sprites which should not be there. But maybe this is a incompatibility in older versions of the emulator? I am not aware of any glitches with Dig Dug and Stella. But in any event, if anyone finds something, please report it to me, and also make sure to use the latest version of Stella (5.0, which will be released this Sunday). Using Stella's built in debugger, I found the funky 8 at 987C - 987F. Hit the ` key to enter the debugger. Right-click near the 8 in the image in the upper left. After selecting Fill to scanline the program should in the area the graphics are being updated. The alternating stores to GRP1 and GRP0 are a key part of the 48 pixel graphic routine. From that I can see the graphic data is coming from tables located at 98AF, 9AA7, and indirectly from 987B (it gets stored into RAM address EC first). 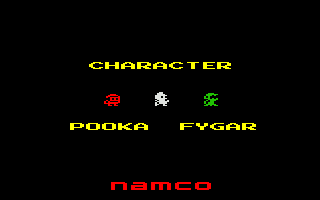 Scroll to 9AA7 and we can see O from NAMCO and part of the 1 from 1982. Scroll to 987B and we can see data, but it's not in graphical representation. What's up is that data's getting stored to RAM, not to GRP0, GRP1, or a playfield register, so Stella and Hack-O-Matic think it's just numeric data as opposed to graphic data. We can tell Stella it's graphic data by typing in the command GFX followed by an address range. once we do that we can see the 198 from 1982. Great description SPICEWARE with all those pics. 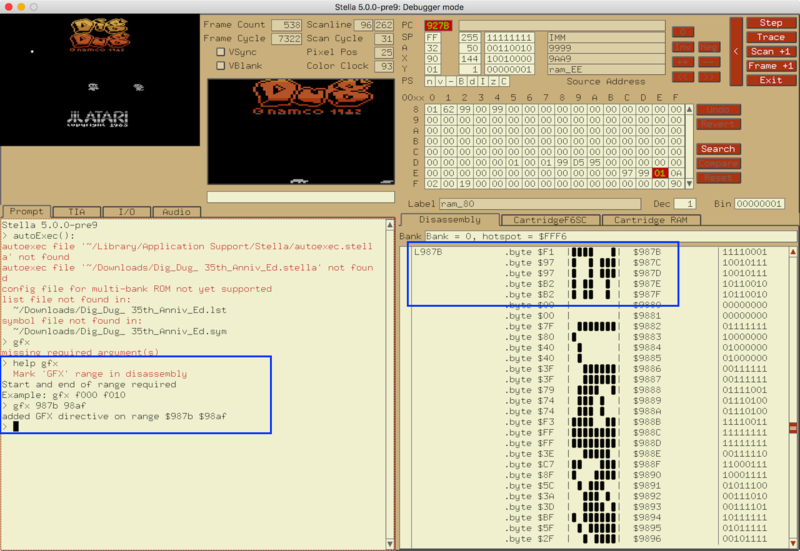 I really must have a deeper look at the debugger in Stella. Maybe also for changing colors in games to adjust them from NTSC to PAL or so. Should work, or? Can the debugger also show the user in which lines of the programm the colors was written, when the user change them in the TIA-Menü? Because when i change them there and restart the game, my new colors are gone. So the change must be made in the lines directly or? Has anyone done a hack where there fire button acts like it does in the arcade (single pump per each push of the button). The 2600 while amazing takes a bit of the challenge away since you only need to press & hold the fire button down to inflate & pop enemies. My father and I were introduced to the game in 1982 while on vacation at Daytona Beach and we were blown away by how fun and different the game was than anything out there. I know that was the only disappointment that my father and I had in the 2600 version the he bought me for Christmas in 1983 (other than that it is an amazing game). 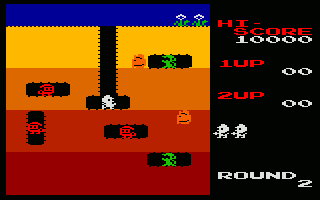 Nice nostalgic memories of this game and I know we both are still very fond of Dig Dug even today. This is an awesome hack, NostAlgae37. Any plans to continue it one day? I'm seeing some glitches in MiSTer, but its 2600 core is still in the early stages of dev I believe. Edited by Smoke Monster, Fri Dec 14, 2018 3:58 PM. Actually yes, I have an updated version that I am working on (with new graphics for the bonus prizes, an updated score font that is arcade exact, and a more readable 1982 on the title screen), but I need some help from the community. Does anyone know if there is there a part of the code that defines the address range that the program looks to fetch the graphics for each individual fruit/vegetable prize from? In other words, does it specify the locations of each of the bonus prizes?